Running up a steep hill in Wimbledon at 9am last Sunday morning with my husband made me think about two things…. 2. Why was I training for a marathon when quite frankly running hurts and is quite boring? Growing up, my Dad was like action man! 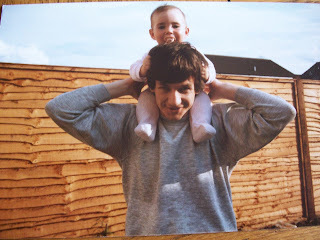 He would play with my sister and I for hours, take us swimming, sledging, play rounders with us and all the other kids in our street…He used to play football, hockey, run and cycle regularly and was by far the fittest member of our family! His life was very active and then everything changed for him and our family when he got ME. He can no longer work or do the hobbies he once loved. He can’t come and visit us in London where we now live. He can’t take my Mum on holidays or even go out most days. Some days he can’t even get out of bed. However despite this, there are things that he has done and continues to do that we are very proud of him for. He has made a lot of great friends with ME and has supported them in whatever way he can though he is limited by his illness. He has campaigned for ME awareness and has continued to fundraise and promote the ME cause over the last few years. And this kind of puts the marathon in perspective! Yes, it is a few months training and it will be tough, but some people have it much tougher. ME might finally be understood and a cure found. Thanks for reading and we will keep you updated with our progress! 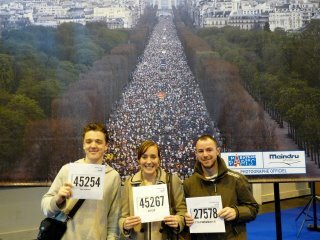 UPDATE: Sunday 15th April - The Paris Marathon was televised live on Eurosport. Dave and Paul finished in under 4 hours and Susie under 5 hours. It was tough going as it was cold and windy! Click here for Paul and Susie March's fundraising page. Click here for David Coleman's fundraising page. Please share and tweet - this biomedical research is aimed at finding treatment(s) for myalgic encephalomyelitis as rapidly as possible - thus helping many thousands of sufferers of all ages across UK and Europe and their families. Thank you for your support - Let's do it for ME!